The circuit containing only a pure resistance of R ohms in the AC circuit is known as Pure Resistive AC Circuit. The presence of inductance and capacitance does not exist in a purely resistive circuit. The Alternating current and voltage both move forward as well as backwards in both the direction of the circuit. Hence, the Alternating current and voltage follows a shape of Sine wave or known as the sinusoidal waveform. In the pure resistive circuit, the power is dissipated by the resistors and the phase of the voltage and current remains same i.e., both the voltage and current reach their maximum value at the same time. The resistor is the passive device which neither produce nor consume electric power. It converts the electrical energy into heat. In an AC circuit, the ratio of voltage to current depends upon the supply frequency, phase angle, and phase difference. In an AC resistive circuit, the value of resistance of the resistor will be same irrespective of the supply frequency. 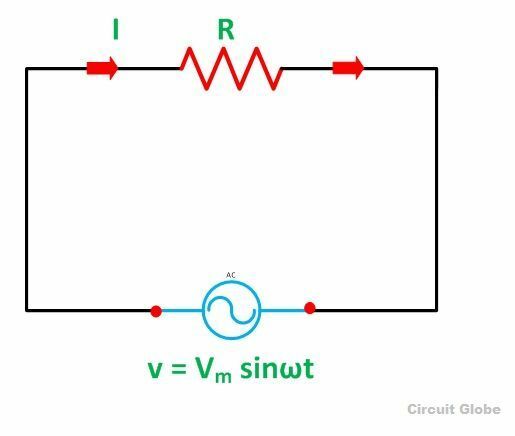 From equation (1) and (3), it is clear that there is no phase difference between applied voltage and the current flowing through a purely resistive circuit, the i.e. phase angle between voltage and current is zero. Hence, in an AC circuit containing pure resistance, current is in phase with the voltage as shown in the waveform figure below. The three colors red, blue and pink shown in the power curve or the waveform indicate the curve for current, voltage and power respectively. 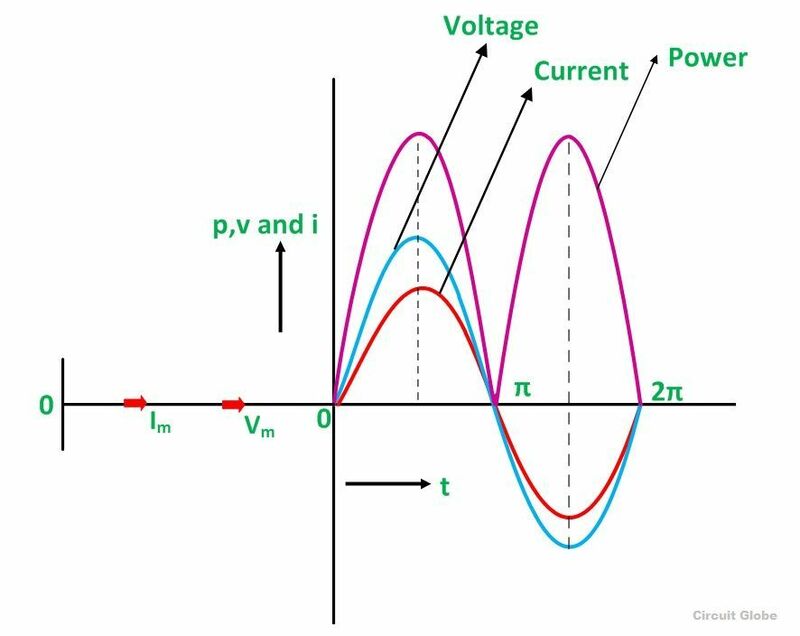 From the phasor diagram, it is clear that the current and voltage are in phase with each other that means the value of current and voltage attains its peak at the same instant of time, and the power curve is always positive for all the values of current and voltage. The voltage and the current in the pure resistive circuit are in phase with each other having no phase difference with phase angle zero. The alternating quantity reaches their peak value at the interval of the same time period that is the rise and fall of the voltage and current occurs at the same time. What are some examples of common components which act as purely resistive loads in AC circuits? I’m guessing things like a light bulb, a toaster, or a kettle? What about a vacuum cleaner, a blender, or a hairdryer? Vacuum cleaner, blender and hair dryer are the examples of the inductive load. The resistive loads are unmotorized and convert all the electrical power in the form of heat whereas the motorised device (inductive load like a blender, hairdryer, fan, etc.) stored some of the energy in the form of an electromagnetic field. so, what are the pure resistive loads for ac supply.